The North Midlands Agricultural Society with support from the Shire of Carnamah have approached two mosaic artists to work with the local community on Saturday 10 August 2013. A large mosaic table top will be created as a gift to the town. We have been assisting with a sample design but are keen for your help with further ideas. 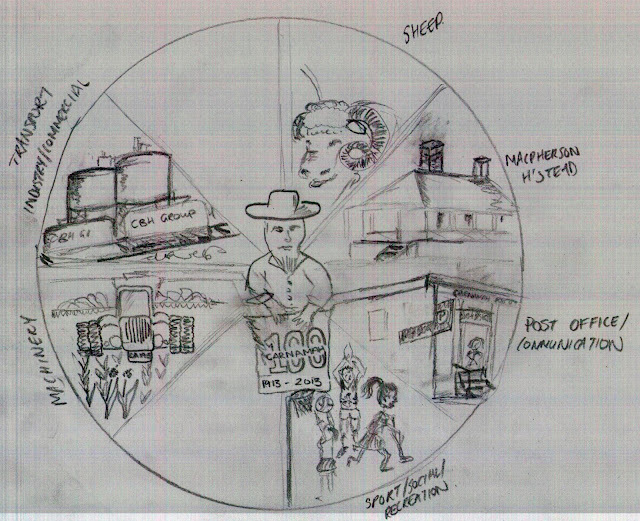 The mosaic will be attached to a round table top, purchased by the Shire and is sectioned to reflect a wagon wheel and facets of Carnamah life. So far it incorporates farming industries of wheat and sheep, communication, the Macpherson Homestead, transport, machinery and sports/recreation. What are your ideas? We welcome any feedback or ideas for aspects of Carnamah life that have played an integral role in shaping the town and its district over the years. Please keep in mind that images will be tiled onto a 1300 millimetre circular table so very intricate designs will need to be considered carefully. If you have any suggestions please leave them in a comment below or send them by e-mail to kirstie_lafferty@hotmail.com.